So in a perfect example of function dictating form, you came up with the turtle - and the Koopa Troopa was born! But how did things develop from there? You’re talking about Hirokazu Tanaka12... 12 Hirokazu Tanaka worked at Nintendo as a composer and was responsible for the music for many titles including Balloon Fight, Dr. Mario and Mother. He is currently the President of Creatures Inc. Yes. So while I was speaking to Tanaka-san, we got onto the subject of what the insides of a turtle were like. Well, Tanaka-san is a really fun guy, after all! We decided that was a great idea and went ahead with the turtles coming right out of their shells. That’s just ridiculous! (laughs) No, turtles’ spines develop to become shells, so of course real turtles aren’t actually able to fly out of their shells. But in the end, while I knew that I was lying to children, I decided: “Look, this way it’s easy to understand so we’re going to make a creature like this!" So while it looks like a turtle, it’s actually not a turtle at all. It’s not a turtle! It’s a Koopa Troopa! So in that way, we tended to look at the functionality and design the game with that in mind. 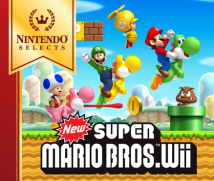 The story of how the turtle came about is one very particular example, but Mario Bros. is full of elements which connect it to the New Super Mario Bros. Wii title we will discuss today, with the pipes, the coins to collect and the fact that it had a multiplayer mode. That’s right. I think we were able to link its sequels to it very successfully. How did you come up with the idea of having pipes in the first place? If you read old comic books, there will always be waste ground with pipes lying around. So the idea that you could get inside pipes when you see them was one that seemed very natural to me. Then when I was making Mario Bros., I realised that if all the turtles that emerged were to fall down to the bottom of the screen, they’d end up piled up there, which would be no good. If Mario went off the right of the screen, he would appear again from the left, wouldn't he? Right. But even with that in mind, having the top and bottom of the screen connected in the same way would have been somewhat odd. Then, on the way home from the office, I spied a concrete wall in a residential area which had a number of drainage pipes coming out of it. I thought: "I can use those!" (laughs) It’s well-established that something will emerge from a pipe and then go back into it. So that’s how you made it so the Koopa Troopas that come out of the pipe at the top will go back into the pipe at the bottom. Just out of interest, why did you decide to make the pipes green? Well, pipes would normally be grey. I don't believe you'll often find green pipes. Well, that’s the first time I’ve been asked that one! (laughs) I don’t really remember the reason why we made them green, but there weren’t that many colours you could use in video games back then. Yes, it was very limited at that time. Of those colours, blue was very bright and beautiful. Green was also very nice when you used two different tones. Those were the things we considered when designing the look of the game. So if we were using two tones together, green was the best colour to have. We didn't make the pipes green because they had to be the same colour as the turtles' shells or anything like that. It just ended up being a good match with the colour of the turtles. Green was just a colour that worked well when combining two shades. That was a bit of a designer's response, wasn't it? Well, there was a time when I aspired to be a designer! (laughs) Well, video game development at that time was essentially a matter of working out how things could be achieved within the limitations imposed by the hardware. Super Mario Bros. 13 which will link in with today’s discussion of New Super Mario Bros. Wii. 13 Super Mario Bros. was a platform game on the Nintendo Entertainment System released in Japan in September 1985 and in Europe in May 1987. It was from that time that I worked on the games together with Takashi Tezuka-san14. I recall there was one time when we wanted a character that would fly up and down but we didn't have enough free space to make a new character. 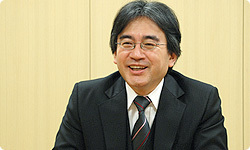 14 Takashi Tezuka has been involved in the development of the Super Mario Series, the Yoshi Series, the Animal Crossing Series and many other games. 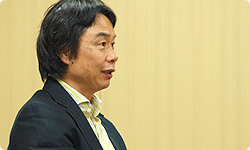 He is the General Manager of the Entertainment Analysis and Development Division at Nintendo Co., Ltd.
Sure enough, if you added up all the programming and graphical data for Super Mario Bros., you only had 40 kilobytes to work with. I thought there was no chance ths would work, but when we actually attached the wings, it looked pretty cute! (laughs) This became the Koopa Paratroopa . Was it Tezuka-san who suggested putting wings on the turtles? I believe so. On Mario 315, we also put wings on the Goomba and called it the Paragoomba . In those days, we were really able to do whatever we pleased. 15 Super Mario Bros. 3 was a platform game released for the Nintendo Entertainment System in October 1988 in Japan and in August 1991 in Europe.